Within the Assessment Manager, the Administration Report is available for all assessments that are In Progress (yellow) or Closed (red). This report provides details about which students have or have not taken a specific assessment for which they have been scheduled. All Users have access to the Administration Report for those assessments pertaining to their students. 1. From the Top Menu Bar, select Assessments (1a). In the Assessment Manager, find the assessment for which you want to review the Administration Report (1b). 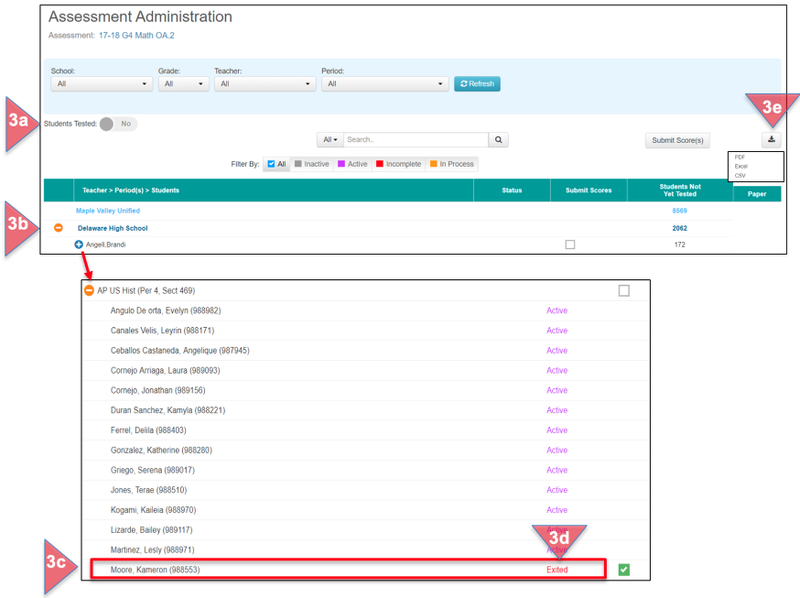 Then click on the down arrow under Functions, and select Administration Report (1c). c. Students Tested: Select Yes (default setting) to view students who have taken the assessment. d. Results: District, School, Teacher, Period, Students Tested, Administration Method, Number/Delete/Move options, Students with Missing CR (Constructed Response) Scores (if the test includes one or more CR items). e. Expand Roster: Click on the green circle with a plus sign to expand a specific roster to view student names. A green checkmark indicates the student has taken the test. An open box allows the student’s score to be deleted (with permission to delete scores). The CR item column shows the item has been scored. Collapse the list by clicking on the orange circle with a minus sign. f. Student search box: Enter the first or last name and click on the magnifying glass. g. Delete: Check the box next to a student’s name and click on Delete (See Step 4). h. Move: Check the box next to the student’s name and click Move (See Step 5). (Please note that this is only available for District Level users). i. Export this report to PDF, Excel, or CSV. a. Slide Yes to No to display the students who have not taken the assessment. b. Click on the green circle to expand the roster. Click on the orange circle to close the roster. c. The Testing Status for each student will display to the right of their name. d. Select the checkbox to submit student scores who have Exited the assessment. e. Export the report to PDF, Excel, or CSV. 4. Deleting the Student’s Score: With permission, a Teacher Level User may be allowed to delete scores for assessments they have created for their own students. A School or District Level User may also be allowed to delete scores for School or District assessments. a. Check the box to the right of the student’s name in the Delete column. b. Click on Delete in the upper right. c. A message will appear confirming this action. Click OK to continue, or Cancel. d. A second message will appear to check that the score should be deleted. Click OK to continue, or Cancel. e. A final message will confirm the deletion. Click OK to continue. 5. Moving the Student’s Score: With permission, a District Level User may be allowed to move scores for assessments. Assessments can be moved from one School Level assessment to another or one District Level assessment to another. They cannot move from a School Level assessment to District or vice versa. In order to move an assessment, the source and destination must have the same number of items, item types, number of choices, and choice types. Scores will then be deleted from the original assessment and will only be available within the final destination. a. Check the box to the right of the student’s name in the Move column. b. Click on Move in the upper right. c. Select the assessment that the results will be transferred to. d. A second message will appear to check that the score should be moved. Click Confirm to continue, or Cancel. e. A final message will confirm the move. Click OK to continue.